I'd like to see some pics too...post a few up! Nice car! That Doberman didn't scratch the paint did it? Also is that your Boss? "There were wrecks all around, and not the kind you fix up for a weekend project." My friends Boss...I've driven that thing a few times and even with 50 miles on the odometer. The paint on my t/a isn't original and needs bodywork so it's cool to not care about it to a degree. I'm more angered about the person who swiped my front bumper that I painted grey and ran off while I wasn't by my car. Some people are just evil. Whatcha doin' with the brown T/A? Just got a spectra classic injection fuel tank gm201fi today. Like others have mentioned, I pulled out the sending unit and the sock had fallen off. That is a serious approach to fuel delivery. I can't wait to see it come together. My valley pan is from BOP Engineering and I also have their PCV "breather" on the driver valve cover. I basically moved the PCV to the valve cover instead of the front like stock ones. It's a fairly cheap modification that costs about $100 for everything. I looked up your part just now, and the item description says "not for use with EGR intakes". I'm stuck with emissions equipment requirements for the time being, so I wouldn't be able to use it. Anyway, thanks for the info and good luck with the rest of your project. I am going to keep a close eye on your FAST system, it looks pretty serious. Someday I want to install a full EFI system - right after I win the Powerball. Cheers! My setup works in the same manner as stock. It's just that the pcv is in the valve cover rather than on the valley pan. You might want to double check and call bop engineering if a mod like this on your mind. These valley pans should have great clearance. Thanks, I will do that. I spoke with Greg at Butler the other day to ask about intakes and valley pans. In a very nice manner, Greg told me that I am S.O.L. because there are no aftermarket valley pans that will accommodate both a stock EGR equipped intake manifold, and also the roller tip lifter arms on the bottom side. But they do have some old OEM valley pans in the shop that can be used for the purpose. I felt bad having to ask a race engine builder about such things, but I have to run all the stock emissions equipment on my engine and pass smog inspection for the time being. But I am really happy to have them build the motor and I know that it will be done well. PS - the reason that I am using a stock intake manifold is that I read an article from a person that swapped out the OEM EGR manifold for an Edelbrock EGR manifold and had some fitment issues with the project. I know, clear as mud, and sorry for the thread creep. And I just got an original '79 L78 400 Quadrajet so I am really happy to have a stock carb to start with. Sorry for being nit-picky, but there was no L78 in '79. So there was no '79 L78 Q-jet. There were only W72 400 engines used in '79. What are the numbers on it. It may be a 77 or 78. From what I recall when I used to have a W72 carb...I believe the number on the side of the body you are looking for is 17059263. Great carb for stock application but I would like to see someone run of those carbs to the fullest power potential with a single plane intake and turbocharger. There is a lot of guess and heresay on that subject though. Thanks Guys, I guess I don't know an L78 from a hole in the ground! ha ha. Sorry for the wrong info. "Life is hard, It's Harder when your'e Stupid.."
Very interesting for sure ! I look forward to see how the EFI turns out. I'm getting the parts together to convert mine to EFI. Thanks Jim, I hope to see your EFI setup come together on the website soon as well. Still planning on the MSD throttle body injection system? You did an amazing job on the restoration in your thread! Yup , I'm gonna go with MSD setup, I picked it up today as well as some other stuff. Think I saw this car locally? Crystal Lake? Yes, it was at my dads house out there for the past two years. The car is in Fox Lake now. Getting side tracked from going about the EFI install. Pulled the tail lights and harness this morning then taped off all the holes so I can start cleaning up the rear section and under the car. I'm debating taking this car down more by pulling the rear end and suspension so I can make things right. Bumper isn't pulled off because I have one stripped nut holding it on. Ordered a KBS all-in-one chassis kit (gloss black) last night so I can start coating the bottom of the car, gas tank, etc. Finally got the bumper off this weekend. I ended up cutting two stripped/rusted bolts to get it out. There is some rust around the area where the bumper mounts on the drivers side, along the bottom of the tail section and the inner tail panel has issues. No pictures yet but I also started using a 4" wire wheel to remove undercoating and seam sealer. It's a very dirty job and I'm doing it so I can then use a liquid paint stripper. Thanks man, that little guy is too nice though. I have a little girl doberman that people have to watch for a little more. Hopefully I don't get banned from this forum for abusing a Trans Am. I just sold my original hood/shaker and ordered a fiberglass VFN cowl induction hood for my car in this thread. I have a friends '78 Trans Am I'm building on the side that I have a very trick induction setup planned for the stock shaker hood assembly. It is a killer photo, so to speak. Showed a few of my other TA fans and it got a lot of laughs. 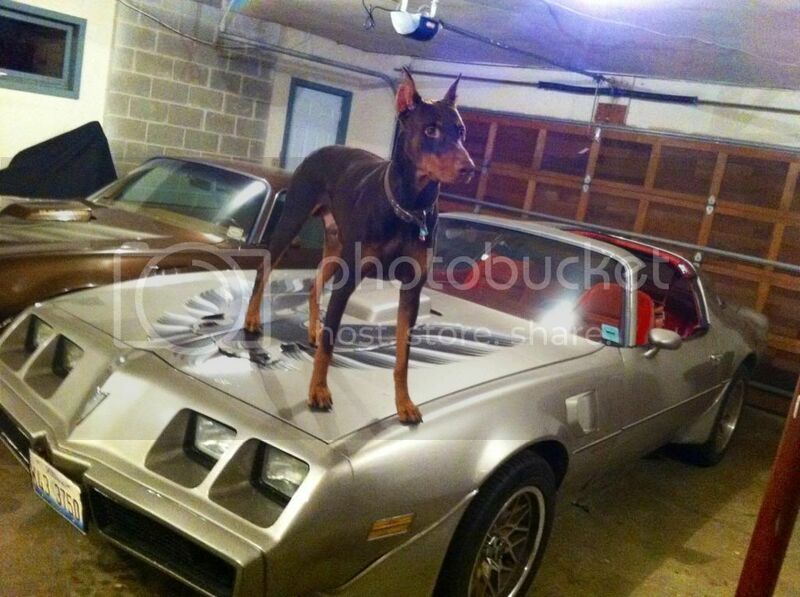 On the serious side, there are several thread here on TAC about protecting our cars and I think the doberman on the hood is by far the best. Been a little slow about getting to work on the car. I pulled the rear end out last weekend and did some more cleaning under the car. I'm still grinding off undercoating before I apply paint stripper. Been slightly boring for pictures of the car lately. I did get a chance to put a couple days of grinding on the underbody...should hopefully be prepared for painting the underside soon enough. It's been a while since I posted. I've been slow to get work done but it's been moving somewhat. As pictured before, I applied the first layer of sealer under the car. I still need to put seam sealer in and paint over that.